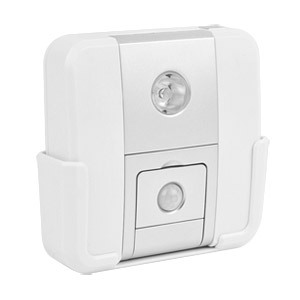 The Rite Lite Motion Activated Wireless Security Accent Light, LPL777, has a super bright, high output, white LED light which is battery operated, eliminating unsightly wires and making installation a snap. LEDs last up to 100,000 hours. The LPL777 has an easy, one-touch ON/OFF switch with dimmer. The convenient, adjustable head assures you will have light right where you need it. For automatic ON/OFF, simply activeate the built in montion sensor, which will turn on the light when motion is detected. Then, the light will turn off again, if no motion is detected, either 30 or 60 seconds later, depending on your preference. Includes a handy mounting bracket for easy installation. Perfect for use in and under cabinets, closets, hallways, garages and so many other places! Also great to keep around the home or office in the event of a power outage.